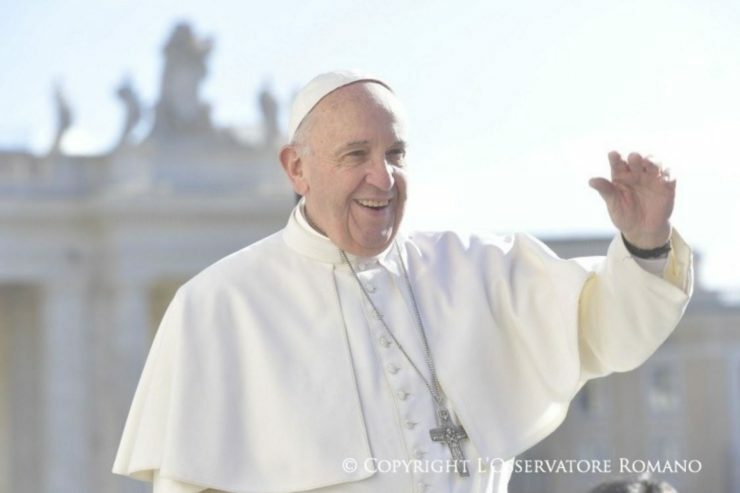 Here is a ZENIT translation of the Message that the Holy Father Francis sent to the participants in the International Congress “Vocational Pastoral and Consecrated Life: Horizons and Hopes,” promoted by the Congregation for Institutes of Consecrated Life and Societies of Apostolic Life, which is being held in the Pontifical Athenaeum “Regina Apostolorum,” from December 1-3, 2017. I greet the participants in this International Congress, promoted by the Congregation of Institutes of Consecrated Life and Societies of Apostolic Life, on “Vocational Pastoral and Consecrated Life: Horizons and Hopes.” I thank this Congregation for the initiative of this event, which intends to be the contribution of this Dicastery to the forthcoming Synod of Bishops, which will be concerned with the theme: “Young People, Faith, and Vocational Discernment.” And while I greet, through this message, all those of you who have arrived in Rome to take part in this meeting, I assure you also of my prayer to the Lord of the harvest so that this Congress will help all the consecrated to give a generous response to their own vocation and, at the same time, that it will help them all to intensify the Vocational Pastoral among families and young people so that, those who are called to follow Christ in a consecrated life or in other vocations within the People of God, will be able to find the appropriate channel to receive this call and respond to it with generosity. First of all, I wish to manifest to you some convictions on the Vocational Pastoral. And the first is this: to speak of Vocational Pastoral is to affirm that all pastoral action of the Church is oriented, by its very nature, to vocational discernment, in as much as its ultimate objective is to help the believer discover the concrete way to realize the plan of life to which God calls him. The vocational service must be seen as the soul of the whole of evangelization and of the whole pastoral of the Church. Faithful to this principle, I don’t hesitate to affirm that the Vocational Pastoral can’t be reduced to activities closed in on themselves. This could become proselytism, and could also lead to falling into “the temptation of an easy and precipitate recruitment” (John Paul II, Apostolic Exhortation Vita Consecrata, 64). The Vocational Pastoral, instead, must be placed in close relation with evangelization, education in the faith, so that the Vocational Pastoral is a true itinerary of faith and leads to a personal encounter with Christ., and with the ordinary pastoral, especially with the pastoral of the family, so that parents assume, with joy and responsibility, their mission of being the first vocational animators of their children, freeing themselves and freeing their children from blockage within egoistic perspectives, of calculation or power, which happen very often in the heart of families, even those that are practicing. This implies cementing the vocational proposal, including the vocational proposal to consecrated life, on a solid ecclesiology and an appropriate theology of consecrated life, which proposes and values appropriately all the vocations within the People of God. A second conviction is that the Vocational Pastoral has its most appropriate “humus” in the youth pastoral. Youth pastoral and Vocational Pastoral must go hand in hand. The Vocational Pastoral rests, rises and develops in the youth pastoral. For its part, to be dynamic, complete, effective and truly formative, the youth pastoral must be open to the vocational dimension. This means that the vocational dimension of the youth pastoral is not something that should be suggested only at the end of the whole process or to a particularly sensitive group to a specific vocational call, but it must be posed constantly throughout the whole process of evangelization and of education in the faith of adolescents and of young people. A third conviction is that prayer must have a very important place in the Vocational Pastoral. The Lord says it clearly: “pray therefore the Lord of the harvest to send out laborers into his harvest” (Matthew 9:38). Prayer constitutes the first and irreplaceable service that we can offer to the cause of vocations. Given that a vocation is always a gift of God, the vocational call and the response to this vocation can only resonate and make itself felt in prayer, without it being understood as an easy recourse to be aloof to work in the evangelization of young people so that they open themselves to the Lord’s call. To pray for vocations implies, in the first place, to pray and work for fidelity in one’s own vocation; to create environments where it is possible to hear the Lord’s call’ to set out to proclaim the “Gospel of vocation, to promote them and cause them. One who truly prays for vocations works tirelessly to create a vocational culture. These convictions lead me to pose some challenges to you that I consider important. A first challenge is that of confidence — confidence in young people and confidence in the Lord. Confidence in young people, as there are many young people that, although belonging to the “selfie” generation or to this culture that is more than “fluid” and already seems “spent,” are looking for full meaning in their lives, even if they do not always look for it where they can find it. It is here where those of us who are consecrated have an important role: to stay awake to awaken young people, to be centered on the Lord to be able to help a youth to center himself on Him. Often young people expect from us an explicit proclamation of the “gospel of vocation,” a courageous proposal, evangelically demanding and at the same time profoundly human, without cuts and without rigidities. Instead, confidence in the Lord, certain that He continues to arouse different vocations in the People of God for the service of the Kingdom. The easy temptation must be overcome that leads us to think that in some environments it is no longer possible to arouse vocations. “Nothing is impossible” for God (Luke 1:37). Each period of history is God’s time, including ours, as the Spirit blows where it wills, as it wills and when it wills (Cf. John 3:8). Any season can be a “kairos” to reap the harvest (Cf. John 4:35-38). Another important challenge is lucidity. It is necessary to have a sharp look and, at the same time, a look of faith on the world and, in particular, on the world of young people. It is essential to know our society thoroughly and the present generation of young people, in such a way that, looking for the appropriate means to proclaim the Good News to them, we are also able to proclaim the “gospel of vocation.” Otherwise, we would be giving answers to questions that no one has posed. A final challenge that I would like to point out is conviction. To propose that “come and follow me” (John 1:39) to a youth today, one needs evangelical daring; the conviction that the following of Christ, also in consecrated life, is worthwhile, and that one’s total self-giving to the cause of the Gospel is something lovely and beautiful, which can give meaning to a whole life. Only thus will the Vocational Pastoral be the narration of what one lives and what fills one’s life with meaning. And only thus will the Vocational Pastoral be a convincing proposal. A youth, as all our contemporaries, no longer believes so much in teachers, but wants to see witnesses of Christ (Cf. Paul VI, Apostolic Exhortation Evangelii Nuntiandi, 41). Differentiated, in such a way that it responds to the questions that every youth poses himself and that offers each one of them what is necessary to fill abundantly his searching desires (Cf. John 10:10). It must not be forgotten that the Lord calls each one by his name, with his history, and He offers each one and asks of him a personal and non-transferable path in his vocational response. Narrative. A youth wants to see “narrated” in the concrete life of a consecrated <person> the model to follow: Jesus Christ. The pastoral of “contagion”, of the “come and see” is the only Vocational Pastoral that is truly evangelical, without a taste of proselytism. “Young people feel the need of close reference figures, credible, coherent and honest, as well as of places and occasions in which they put to the test the capacity of relationship with others” (Synod of Bishops, 15th Ordinary General Assembly, Young People, the Faith and Vocational Discernment. Preparatory Document, 2017, 2). Only an incarnated faith and vocational proposal has the possibility of entering in the life of a youth than the contrary. Ecclesial. A proposal of faith or vocational <proposal> to young people must be done in the ecclesial framework of Vatican II. This is the “compass for the Church in the 21st century” (John Paul II, Apostolic Letter Novo Millennio Ineunte, 43) and for consecrated life in our days. This ecclesial framework asks a commitment of young people and a participation in the life of the Church, as actors and not as simple spectators. They must also feel themselves participants in consecrated life: its activities, its spirituality, its charism, its fraternal life, its way of living the following of Christ. Evangelical and, as such, committed and responsible. The faith proposal, as the vocational proposal to consecrated life, must stem from the center of all pastoral <care>: Jesus Christ exactly as He is presented in the Gospel. Evasion or intimate flights or merely social commitments are no good — far from the Vocational Pastoral, “the “pastoral show” or the ”pastoral hobby.” A youth must be faced with the exigencies of the Gospel. “The Gospel is demanding and calls for being lived radically and sincerely” (Letter to All the Consecrated, November 21, 2014, I, 2). A youth must be put in a situation in which he accepts responsibly the consequences of his faith and the following of Christ. In this type of pastoral, it is not about recruiting social agents, but true disciples of Jesus with the Lord’s new commandment as watchword and with the code of the Beatitudes as style of life. Accompanied. One thing is clear in the youth pastoral: it is necessary to accompany young people, to walk with them, to listen to them, to challenge them, to move them so that they go beyond the comforts in which they rest, to awaken the desire, to interpret for them what they are experiencing, to lead them to Jesus and always fostering freedom so that they respond to the Lord’s call freely and responsibly (Cf. Synod of Bishops, 15th Ordinary General Assembly, Young People, the Faith and Vocational Discernment. Preparatory Document, 2017, III, 1). It is necessary to create an atmosphere of trust, to make young people feel loved as they are and for what they are. The text of the disciples of Emmaus can be a good example of accompaniment (Cf. Luke 24:13-35). A personal relationship with young people by the consecrated is irreplaceable. Youthful. We cannot treat young people as if they are not such. Our youth pastoral must be marked by the following notes: dynamic, participatory, joyful, hopeful, risky, confident, and always full of God, who is what a youth most needs to fill his just yearnings for plenitude; full of Jesus who is the only Way they must follow, the only Truth to which they are called to adhere, the only Life for which it is worthwhile to give all (Cf. John 1:35ff). Dear participants in this Congress: two things seem certain to me in the theme of Pastoral Vocation and Consecrated Life. The first is that there are no magic answers and the second is that consecrated life, as the rest of the whole Church, is being asked for a true “pastoral conversion,” not only of language but also of lifestyle, if one wishes to connect with young people and propose to them a path of faith and offer them a vocational proposal. Let no one rob you of the joy of following Jesus Christ and the courage of proposing Him to others as Way, Truth and Life (John 14:6). Let us break our fears! It is the moment for young people to dream and old men to prophesy (Joel 2:28). “Let us rise now! Let’s get “down to work” (Ezra 10:4). Young people are waiting for us. It’s the time to walk!